The Hyophorbe lagenicaulis or Bottle Palm has a wonderfully unique bottle-like shape and beautiful sculpted maroon crown-shaft. Its large swollen base is thought to store water. This slow growing small tropical palm loves warmth and is excellent container grown. The Bottle Palm is endemic to one small Island off of the coast of Madagascar. The Bottle Palm is somewhat cold sensitive and do not like temps below 32F degrees. 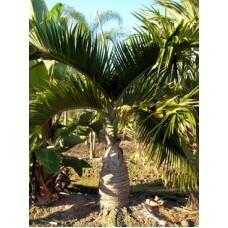 Mature Bottle Palms will take an occasional light frost, but will be damaged. The Bottle Palm is an excellent specimen plant and grows well in containers. The maximum height is 10 - 12 feet, but much smaller in a container and will take many, many years to reach this height.